I was thinking about this on a particularly hot Southern California summer afternoon, the desert winds blowing through the canyon and out to sea. It was stifling, I was thirsty… and then it came to me: My best idea! It began with a half-eaten watermelon sitting on the kitchen counter. I was reminded of a post about watermelon agua fresca on my friend’s Jessica’s blog, Attempts in Domesticity. I pulled up her website, glanced at the instructions, and made myself a nice cold pinkish glass of watermelon agua fresca, which was just as refreshing as the post had suggested. Today, however, in the near-Mexican heat, it was tequila I had on my mind. And tequila I turned to. The result was something of a modified Mexican margarita, served in margarita glasses rimmed with lime, ground chili and salt. I’d used less watermelon and more lime than the recipe, plus some blue agave syrup in place of sugar (since I’d be using tequila). And finally, put a bunch of ice into the blender with the other ingredients (Jessica’s recipe was on the rocks). Since my best idea was a combination of her agua fresca and a margarita, I dubbed my afternoon inspiration the “Watermelon Aguarita.” And drank up. Okay, so maybe it wasn’t the best idea I’ve ever had, and did depend on borrowing from other sources (“Standing on the shoulders of giants,” as Sir Isaac Newton put it). But on that particular afternoon, solving the origins of the universe would’ve been no more satisfying that the synergistic confluence of watermelon, tequila, lime and ice. Place first four ingredients in a blender with about 2 cups of ice. Blend until smooth. Toss together the salt and ground chili, and place on a plate. 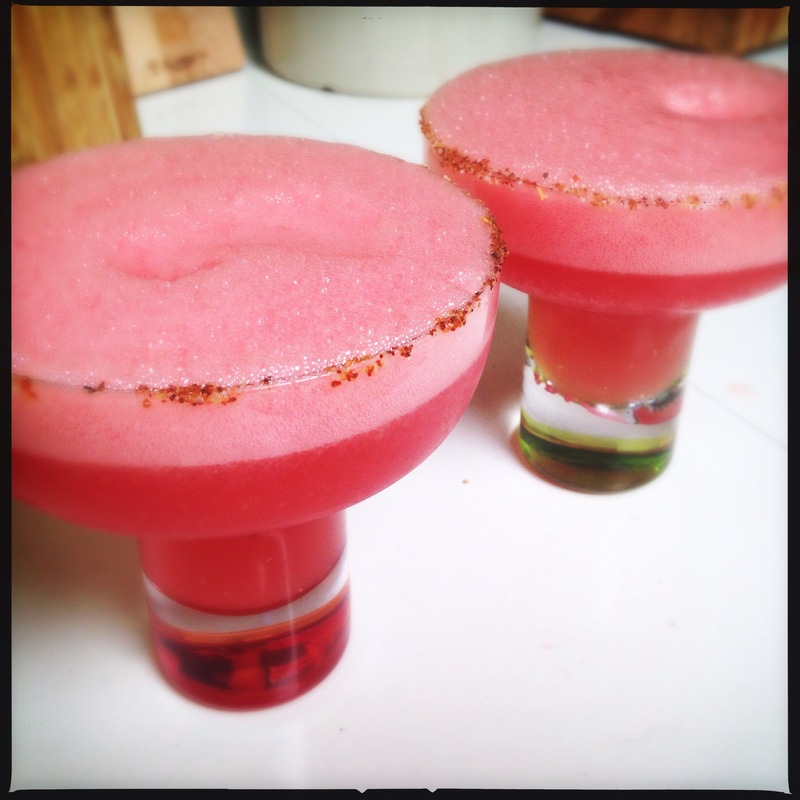 Brush the rim of two margarita glasses with lime, then dip the rim in the salt/chili mixture. Pour aguarita into glasses. Winner gets the leftover aguarita from the blender. I like the non alcoholic one for my non drinking friends whom I like to accommodate. BTW when you say I’m thirsty does it ever mean water? Sometimes it means water. But not usually. I think I’m feeling cooler already just reading about your drink. I love that you always have the perfect glass for your concoctions. Drink on, old’ buddy. It’s all about the glass. Well, it’s partly all about the glass. That would work in my tropical side of the world . . . and I have Friday off with nowhere to be but poolside working on the “Wave” mosaic, which is turning out pretty fantastic for a couple of mosaic novices. Watch your mail next week! Something special your way comes!! Friday is a good day in Central FL! Have a drink for me whilst I go out and press my eye agin’ the mailbox. Give it a week so you don’t have a hard pressed eye! I’m off to the store for some Tequila. Limited selection in FLA but I’ll take suggestions on good mainstream Tequilas. Gearing up for the 10 day BVI Rum extravaganza in mid August. Sailing the big Catamaran to Anegada Island (check it out and the snorkeling for urchins should prove good so I can try that double sp-uni trick). Cazadores is my go to tequila, and should be available at most grocery stores. Camarena is a good less expensive tequila. Man, whenever you’re out sailing, I wish I had your life! Nice galley for some high seas dining, cookie! Ceviche you later my great friend!! It’s the Half Dome of summer beverages! OH MY GOD! Yes! Funny enough I made some watermelon jello shots last night for a get-together I’m hosting today. I have about 2 cups leftover juice, plus lime juice plus tequila. I am SO making these for my friends today. Thanks for the shout out and the inspiration! I am fully on board with this being the best idea ever, especially since I believe anything with booze > things lacking booze. OMG, you’re not STILL making jello shots ARE YOU!??? Yummy. We had watermelon margarita’s at my groom’s dinner in Playa del Carmen. Lovely little restaurant on the north edge of town, away from the hustle and bustle. http://www.lacuevadelchango.com/ I’ve never attempted to make them at home. Thanks for the inspiration. I am wondering how the watermelon juice would turn out run through a juicer rather than simply crushed and blended? Super cool. I checked out the website, I’m not that familiar with Caribbean Mexico, having logically spent all my time in Baja and on the Pacific Coast. But I’m just dying to visit a state with the name, “Quintana Roo”!! I’m sure it would be great run through a juicer, although the consistency of watermelon flesh merges nicely with the ice.